Will Hillary Clinton’s Speech on Disability Employment Impact Conversation Topics at First Debate? The very flexible nature of these topics will allow debate moderator Lester Holt of NBC News to ask about current events and recent topics of conversation. 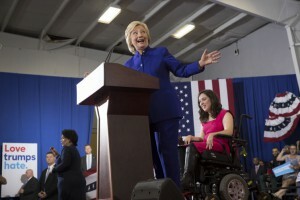 One such topic is employment for people with disabilities, as was highlighted by Democratic nominee Hillary Clinton during a speech in Orlando last week. Saying that the inclusion of people with disabilities in the economy would be “a vital aspect of my presidency,” Clinton went on to detail a few policies. This is not the first time Clinton talked about either of these issues. She talked about the importance of competitive, integrated employment in her response to the #PwDsVote Presidential Questionnaire and first pledged to end sub-minimum wage while speaking at a campaign rally in March. Following the speech, The RespectAbility Report caught up with former congressman and co-author of the Americans with Disabilities Act Tony Coelho, who began working on disability issues with Clinton when she launched her campaign 18 months ago. Coelho, who has epilepsy, said that Clinton first wanted to address Alzheimer’s disease, then autism, then mental health and now employment for people with disabilities. Clinton was introduced by Anastasia Somoza, who, along with her twin sister, was born with cerebral palsy. Now a disability rights advocate, she first met the Clintons when she was nine years old. Speaking with The RespectAbility Report after Clinton’s historic speech, which she called “unprecedented,” Somoza credited both of the Clintons with enabling her to achieve some of her success. During tonight’s debate, when Holt will ask Clinton and Republican nominee Donald Trump questions during the “Achieving Prosperity” section, he has another opportunity to highlight disability employment in an unprecedented manner. After all, people with disabilities make up the largest minority group in the country, with 56 million people with disabilities seeking information and answers. One in five Americans has a disability and the majority of voters have a loved one with a disability. In past elections, the disability community has been ignored. But the recent Pew poll shows that voters with disabilities span the political and demographic spectrum and can determine who wins elections. RespectAbility and The RespectAbility Report are nonpartisan and do not endorse candidates. Early voting starts soon, and many members of the disability community vote absentee. Tomorrow marks National Voter Registration Day, of which RespectAbility is a partner. Interested readers can learn more about how to register to vote and about local volunteering opportunities by visiting Rock The Vote.